Figure 1. Adult corn rootworm and a damaged leaf. Note the ‘scraping’ damage on the corn leaf, upper left corner of the photo. This damage is characteristic of very high infestations of the adult rootworms and is not uncommon in late-planted fields. Figure 2. Corn rootworm damage in late-planted corn. This field was planted late the previous year and acted as a trap crop for adult corn rootworms. Planting season got off to a bumpy start this year and we may suffer a few consequences from it late this summer. 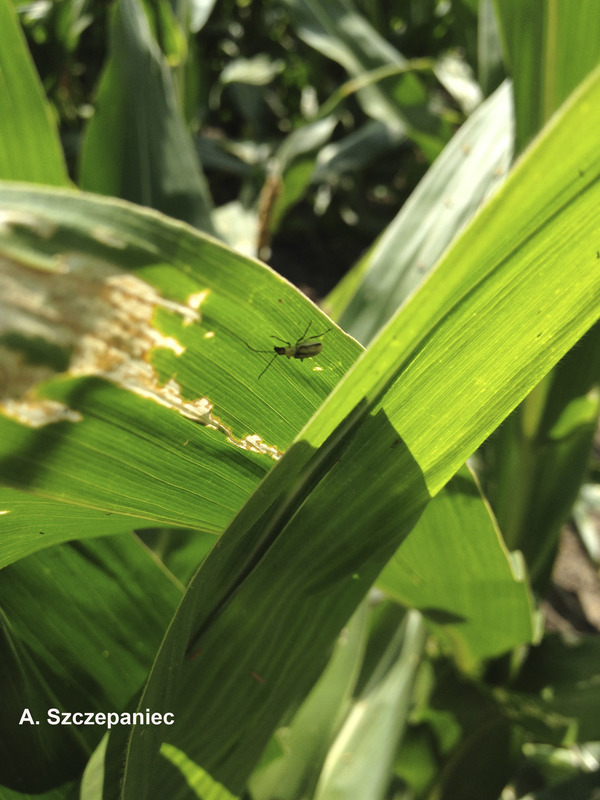 Late-planted corn and soybean are likely to be more susceptible to insect infestations, which may have consequences this year and into the 2015 growing season as well. Late-planted crops are especially attractive to insects. They are delayed in their maturation compared to crops planted earlier and may provide better food resources for insect pests. One particularly important pest to scout for is adult corn rootworm (Figure 1). Females require a carbohydrate food source before laying eggs and late-planted corn may still have nutritious silks to feed on compared to earlier planted corn. This may not be relevant for this year’s crop (unless damage is severe; if that’s the case follow these guidelines). It may, however, impact management decisions if corn is going back into that field in 2015. Late-planted corn acts as a ‘trap crop’ in this instance — corn rootworm adults will be preferentially attracted to these fields, colonize them, use the available food resources such as silks and lay eggs in those fields (Figure 2). Large numbers of females laying their eggs mean high populations of larvae in 2015. 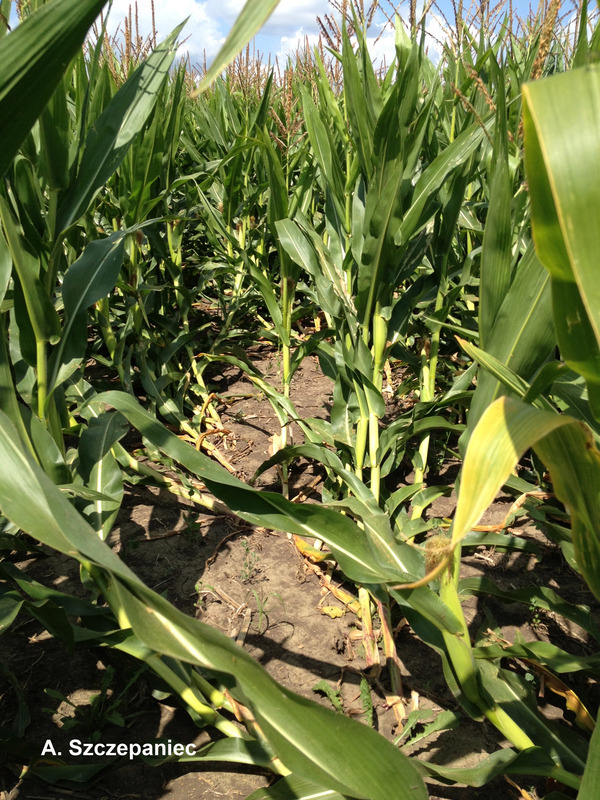 If a late-planted cornfield is rotated to another crop in 2015 it will not have much of an impact. If the field is going back to corn, however, and high numbers of adult corn rootworms are noted this summer an aggressive corn rootworm management plan may be needed in 2015. Late-planted soybeans may also be especially attractive to insect pests. Soybean aphids as well as bean leaf beetles and adult corn rootworms will find younger, lusher soybeans an appealing source of food when ‘older’ fields mature. Paying some attention to these later planted fields will ward off potential economic losses caused by intense insect activity.